When trying to decide whether to invest in your current home and renovate rather than selling your house and purchasing a new one, homeowners often consider remodeling their kitchen or bathroom. Here is some information that may make your decision to sell or fix up your home a little easier. Consider using the 5 to 15 rule. Basically, the rule states: The entire kitchen project (including cabinets, appliances, countertops, flooring, lighting, trim molding, & wall coverings) should cost no less than 5% and no more than 15% of the current value of your home with approximately 50% of the total cost allocated for cabinets (including accessories and trim).” The typical kitchen budget is 8% of your home’s value. Remember even if you are spending more there are still limits, the addage ‘anything goes’ does not apply. The total cost of high-end custom kitchen should not exceed 20% of the current market value of the house.” Spending more could reduce your chances of getting even a minimal return on your investment. When doing a master bath remodel, “a rule of thumb is that the total project—including materials and installation—should cost no more than 5 to 10 percent of your home’s value. The National Kitchen & Bath Association (NKBA) puts the national average at about $16,000. Another guide is Remodeling Magazine’s Cost vs. Value report, which compares the average cost of various renovation projects with the value they retain at resale. In 2011-2012, mid-range bathroom remodels cost an average of $16,552 and recouped 62 percent, while upscale bathroom remodels cost an average of $52,249 and recouped 56 percent,” says Consumer Reports Magazine. Also under consideration are secondary bathrooms such as powder rooms and guest baths. As the homeowner, you may not spend as much time using them, but renovating secondary baths may also provide a strong return on your investment. 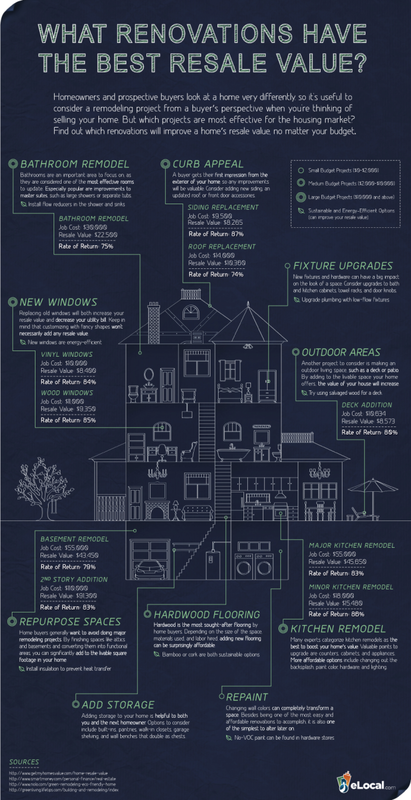 The info graphic below offers some other options for seeing a return on your investment when improving your home.